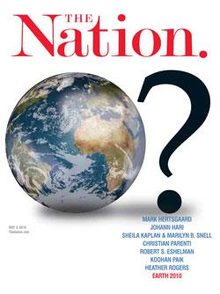 Much to [what I'm sure would be] the dismay of my more conservative friends, were they to find out, I read the Nation magazine from time to time. Actually, I subscribe to it on my e-reader. In the July 2 edition, there is much devoted to the subject of "Islamaphobia." It got me thinking about whether or not I actually know any Muslims, let alone have any I call a friend. I think not. I don't ignore them or shun them for their beliefs, I just think I have been denied the opportunity of knowing any through geography, if nothing else. There just isn't a significant or visible Muslim population in the vicinity of where I live and work, that I am aware of. There is an article in the July 2 issue called Fear and Loathing of Islam, written by Moustafa Bayoumi. Here are some interesting, but somewhat troubling, facts I gathered from the article: A Washington Post/ABC News poll taken in October 2001 found that 39% of Americans had an unfavorable opinion of Islam. Bear in mind that the poll was taken shortly after the attacks of 9/11. That percentage then dipped a little for a while but eventually rose to 46% in 2006 and 49% in 2010 (the last year such a poll was taken). Other polls show that the number still hovers near 50%. The author goes on to cite examples of law enforcement, the news media and Hollywood contributing to this anti-Muslim sentiment. Sadly, I can understand people falling prey to such viewpoints. Emotions can easily escalate when a small minority of the Muslim population screams "Jihad" and is paraded through the news media as prime examples of what it means to be Muslim. I can't help but recall from my history lessons the way in which we interred the Japanese in camps "for their own safety" after the attack on Pearl Harbor and throughout much of the duration of that war. I can look back on that through the eyes of one who wasn't alive then to witness the horror and feel the anger of a surprise attack that killed so many and crippled our fleet. My father was around back then and served in the Navy aboard the U.S.S. Hornet. I am pretty sure he understood the concept of imprisoning Japanese Americans at that time and nobody could have likely convinced him otherwise. Sadly though, many forgot the last part of their classification: Americans. Not Japanese, but Japanese Americans. Just as they were Americans, so are the Muslims referred to in the aforementioned article in the Nation. If you can bear a little progressive rant from time to time, pick up a copy of the Nation or subscribe electronically, as I do. You might find it a good read on occasion. I know I have. I think it's a pretty decent magazine that has a lot of food for thought contained within its articles. I have more articles on the subject matter to devour that could possibly require yet another post on the issue. I am in the process of formulating and organizing some thoughts on the recent SCOTUS ruling on the health care legislation and will post something soon.